In this video, you’ll learn how to use Ahrefs’ SEO toolbar for effective keyword research, link prospecting, content research, and more. Today, we’re excited to announce that Ahrefs’ SEO toolbar has been updated and is faster, stronger, and better than ever. You can download it as a Google Chrome and Firefox extension/add-on from their respective webstores (links below). This SEO tool goes far beyond ‘vanity metrics.’ In fact, it integrates with some of Ahrefs’ tools such as Site Explorer and Keywords Explorer. 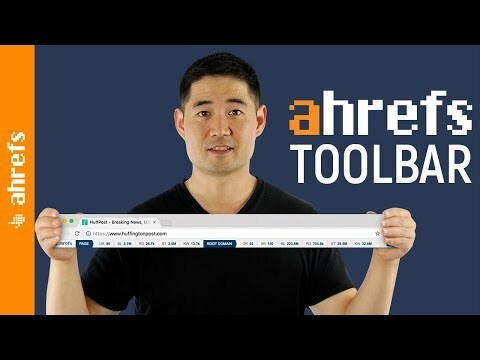 ► The two main places you can use Ahrefs’ toolbar. ► The functions of the SEO toolbar. ► Examples of where the toolbar is effective for keyword research, guest post prospecting, and competitor analysis. ► How to effectively use the SEO toolbar on websites that are NOT Google or Bing.